Dispersa streams monitoring service uses a distributed checkpoints network for checking customers' media. This covers a majority of use cases for typical streaming media business. However, there are cases when our external service cannot check your streams. You may have a streaming server inside of your enterprise network. A good case for making broadcasts or build your company knowledge base with videos and screencasts. Typically company networks have limited access to the external web so media server is not accessible by our checkpoints. Some streaming media may have distribution limitations due to copyright and licensing terms. So you may use geo-location restriction and you may need to check your streams from within your geographical region. The same applies if you limit your streams to preferred telecom operators. We extend our checkpoints geography all the time but there may still be points which cannot be reached from our locations. Any streaming server which is inaccessible from all of our distributes checkpoints network, needs some other approach to be checked over. We need a checkpoint within your "secure perimeter" which would be able to make periodical check overs. It's possible with help of Nimble Streamer light-weight media server. You need to follow these 2 simple steps. 1. Install Nimble Streamer using some Linux server - either virtual or dedicated. The installation process is straight-forward so it won't take much time. 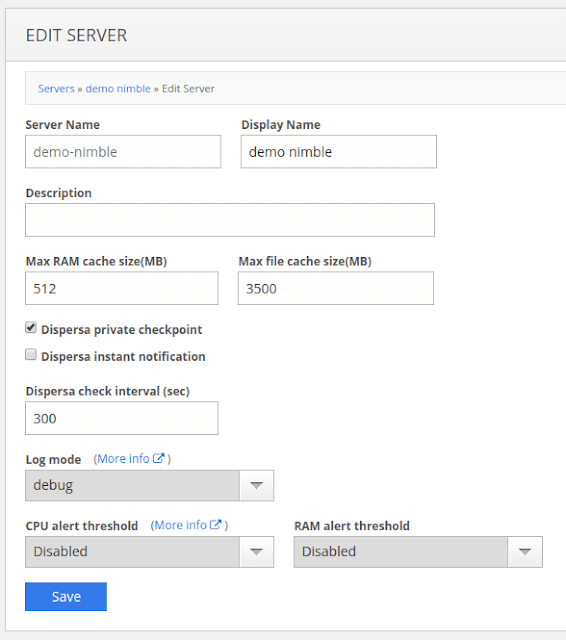 Nimble instance will appear in your WMSPanel account. 2. Go to Servers page and click on Edit link. In our example we installed "demo nimble" server. Check "Dispersa private checkpoint" check box, then enter check interval and save changes. "Dispersa check interval" defines time period for check-overs. This value must be bigger than 30 seconds. When Dispersa cannot reach the stream, it waits for the next check-over and if the stream is still not available, it initiates the offline notification for the customer. If you want Dispersa to run notification immediately after stream failure, please check "Dispersa instant notification" checkbox. 3. 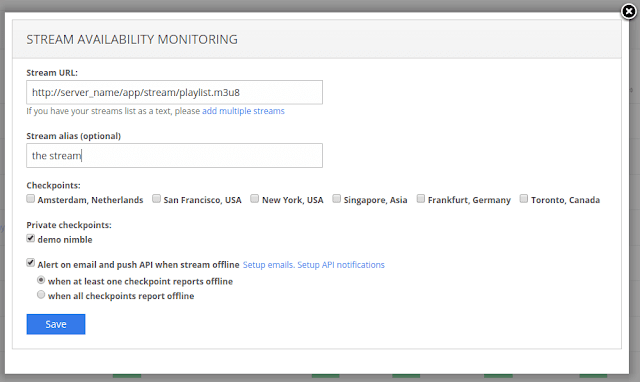 Follow streams monitoring set up instruction and select one or more existing Nimble instances when setting up streams to monitor. Here you can see "demo nimble" as the only available checkpoint. Just check required checkpoints and click on Save. That's it. Nimble instances will start their periodical check over. You will see the instance name in the list of checkpoints. Checkpoint monitoring data is saved in streams monitoring history. So now you can use Nimble Streamer for building your own monitoring and disaster prevention system. Contact us if you have some use cases which you'd like to cover. P.S. Notice that as the Nimble Streamer is properly set up, you may go further and use it for HLS re-streaming or for HLS VOD streaming.